On February 7, at 19:36 an emergency call was received to “911” service that a car accident had occurred on Vanadzor-Dilijan highway: the rescuers’ help was needed. 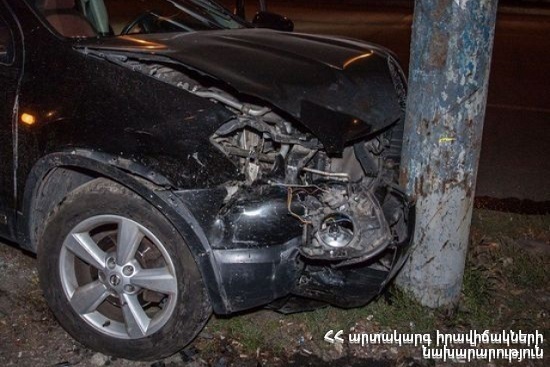 It turned out that “Opel Vectra” car had crashed into a concrete electric pillar near Tezh Ler 3/1 on Vanadzor-Dilijan highway. The pillar had fallen onto the car. Before the rescuers arrived at the scene the driver and passenger had been hospitalized to the medical center of Vanadzor town. According to doctors the driver was in satisfactory and the passenger was in fair condition.